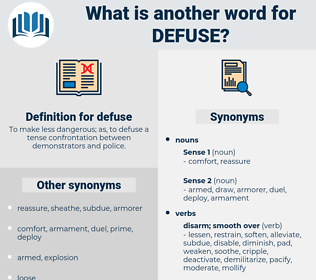 What is another word for defuse? To make less dangerous; as, to defuse a tense confrontation between demonstrators and police. 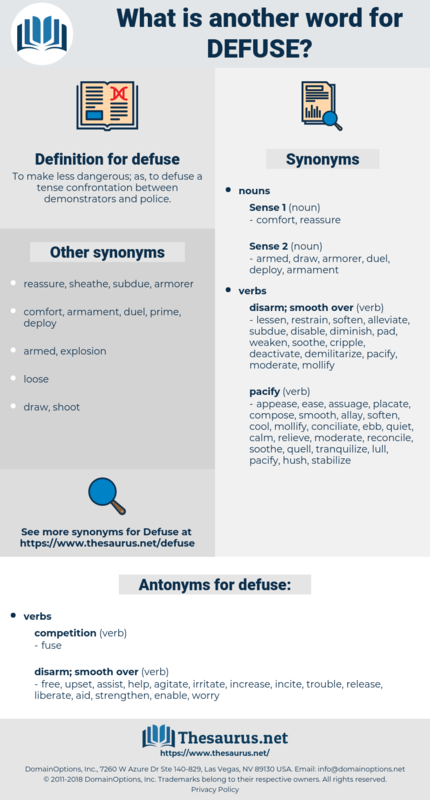 appease, assuage, neutralize, neutralise, mitigate, Mitigating, deactivate, dispel, soothe, allay, resolve, resolving, placate, relieve, quell, pacify, disable, lessen, dissolve, reduce, reducing, solve, dismantle, attenuate, avert, calm, eliminate, Eliminating, soften, extinguish, address, ameliorate, disarm, decommission, counteract, remove, dissipate, relax, settle, lighten, pre-empt, eradicate, loosen, dilute, cushion, minimize, dampen, inactivate, decrease, overcome, diminish, subside, suppress, counter, deselect, avoid, prevent. free, upset, assist, help, agitate, irritate, increase, incite, trouble, release, liberate, aid, strengthen, enable, worry. debs, diaphysis, diadophis, deep-six, dibbuk, davys, debussy, daboecia, debouch, dipsacaceae, dieback, date back, deep kiss, doofus, deific, dubious, die back, devoice, database, debauchee, debug, diffuse, devise, device, devisee, deep-sea, deface, dovekie, ditty bag, day book, davis, Dovish, defog, dative case, devious, dybbuk, debauch, dabchick, dubuque, du bois, debase, depose, dipus, daviesia, devices, dipsacus, De Bakey, daybook, deedbox. take, withdraw, take away, remove.